Lippenbroek Experimental Wetland is a freshwater CRT (controlled reduced tide) in natura tidal facility, surface 8 ha, formerly used as cropland. Vegetation has been progressively replaced by flood-tolerant species (e.g. Lythrum salicaria, Lycopus europaeus, Salix sp., Typha angustifolia and Phragmites australis). Reconstruction of spring-neap tide flooding variation required the construction of separate inlet and outlet culvert. 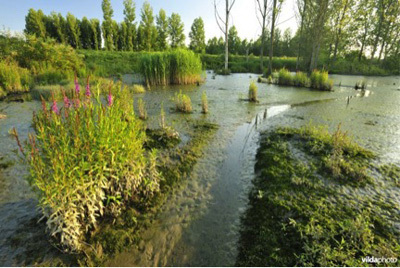 Lippenbroek Experimental Wetland is currently well equipped to study water and sediment balances. ADCP discharge sensors and automated sampling equipment at in- and outlet culverts allows for the detailed measurement of in- and outgoing water fluxes and quantification of the water and sediment balance. Ten sampling sites are installed with sediment elevation tables and piezometers. The flexible dimensions of the culverts allow the manipulation of the volume of incoming and outgoing tidal waters and hence manipulate tidal height, inundation frequency and inundation duration. 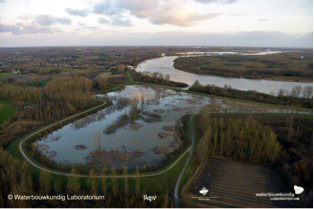 Lippenbroek Experimental Wetland is currently the only facility that allows in situ manipulation of various tidal characteristics in such detail and large scale. Multiple sampling sites across the area have been identified, with different elevations, allowing to assess at the sampling spot scale (12 m2) the effect of different flooding frequencies and duration, due to the differences in elevation. 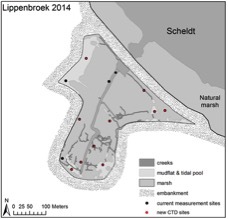 Only one general tidal regime can be installed for the whole area, although a good definition of sampling spots within Lippenbroek (based on the digital elevation map) allows for assessing effects of specific flooding regimes locally in more detail. The future upgrades include 16 flexible gas exchange measurement setups (CO2, N2O, CH4) fluxes, allowing, a whole ecosystem tower for eddy covariance fluxes of CO2, H2O and CH4, permanent water quaity setups for all major nutrients that can be flexibly deployed, and upgrade of the facilities for flow measurement.